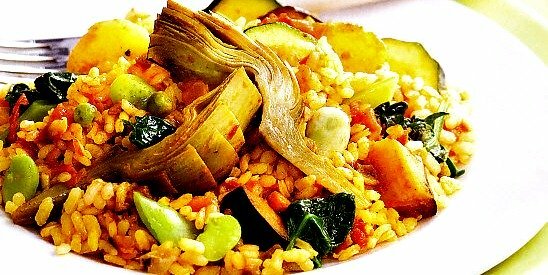 This is the real Chicken Paella recipe, an alternate way of tasting authentic Spanish recipes. Start by heating half of the oil and once warm add the cut chicken and let it cook for 15 min. Once it's brown, reserve it in a dish. Add the chopped onion. After 5 minutes, add diced tomatoes, without seeds and peeled. Let it braise about 5 minutes more, mashing the tomatoes with a skimmer. 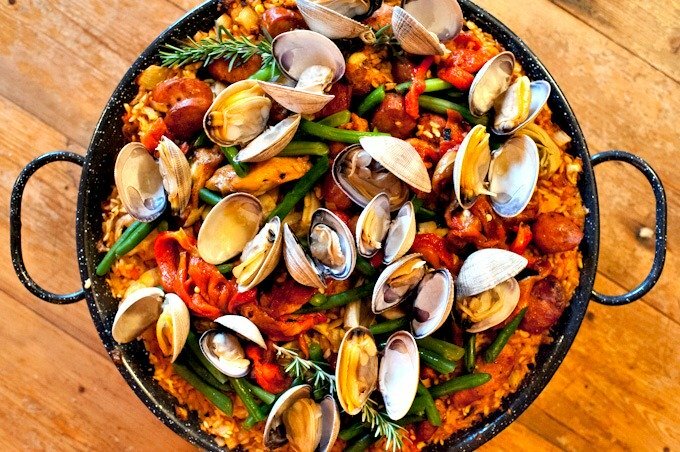 Strain it and throw it in the paella pan. Add the rest of the oil to the paella pan. Throw the green pepper, cut to square pieces of half inch. Add the fried chicken. Keep stirring with a wooden tablespoon, without letting it go brown. Throw salt, and the meat broth, hot but not boiling. This is completed with the 5 broth bowls. Shake the paella pan a little taking it by the handles so that it is broth flows all over. All this should be made to medium fire. Meanwhile, in a mortar mash a little bit of garlic (optional), the parsley and the saffron, with a little bit of salt so that it doesn't slip, and it wet it with a couple of soup spoonfuls of temperate water. Spill this mixture on the rice and shake again the paella pan. When the broth has reduced to the half decorate the paella with the red pepper cut to ribbons, and the peas.